Marina San Giusto’s megayacht port is fit to host vessels of up to 30 metres and yachts of up to 100 metres’ length. All berths are provided with half-inch joint water pumps and sockets. The tourist harbour also has a 24/7 cctv surveillance system and a wireless connection to the web. 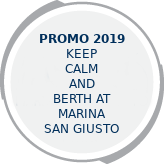 All units of up to 30 metres will dock broadside on top of the Pescheria pier and on the Bora wind (NE), whereas the megayachts will be moored alongside the selfsame with the prow facing the sea in order to avoid obstructions with the cruise ships standing at the adjacent Bersaglieri pier. All yachts must fulfil the regulations terms, with particular care of the disposals concerning the maritime traffic. Marina San Giusto’s megayacht port adheres to and is compliant with the ISPS international code enhancing the security of ships and port facilities. San Giusto Sea Center S.p.A.